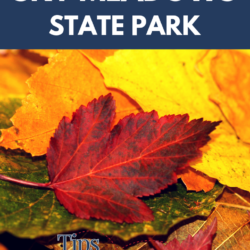 Today I’m sharing a great hike in Sky Meadows State Park the kids and I took this summer that would be AMAZING in mid-October when the leaves change. And by the way, if you want to know when and where to find beautiful fall foliage in Virginia, check out the weekly fall foliage report from the Virginia Department of Forestry. Weekly updates begin the end of September. One big reason I loved Sky Meadows State Park is that it close to the Washington D.C. area. I only had four hours round-trip for my outing, and I was able to drive, hike with my kids, and return home before noon. You could certainly spend much more time there, and our hike was limited by the distance my two-year-old was willing to walk (or I was willing to carry him). Here is our experience hiking Sky Meadows State Park with kids. Sky Meadows State Park has 22 miles of hiking trails. I started from the parking lot with my young kids and headed for Gap Run trail. The first section of our hike was along a gravel road, and then we hiked on a well-maintained trail. The trails were well sign-posted and the map was easy to follow. There were routes to shorten our hike when my kids tired, but we could easily have continued our hike. Perhaps my favorite thing about Sky Meadows State Park was how peaceful it was. The day we hiked we only saw one other couple hiking, and we were alone in the woods listening to the sounds of the forest all morning. I truly love hiking to waterfalls and popular routes in places like Shenandoah National Park, but the quiet peacefulness of this outing made for a different and enjoyable experience. Tour Mount Bleak House to see how a middle-class farm lived in the mid-1800s. The park offers nature programs in the spring, summer, and fall, including some festivals such as the Delaplane Strawberry Festival. Consider horseback riding, bicycling, fishing, or primitive camping at Sky Meadows State Park. We visited Sky Meadows in the summer, and it was green and beautiful. It was a great place to get our nature fix while the kids were out of school. The park is open year-round, so any day that is nice for outdoor activities is a nice day to visit Sky Meadows. I plan to return to Sky Meadows State Park in the fall. The leaves would be gorgeous in mid-October. I lived in Texas for eight years, and I’m sure that eight-year drought of colorful leaves contributed to my longing for fall. Something about the warm, sunny days giving way to crisp, fall evenings makes me want to camp, hike, walk, and drive just to spend every minute I can outside enjoying the fall weather. Whenever you visit Sky Meadows, it’s a great destination for families. Have you been here? Please share your tips and favorite places in the comments! Where: Sky Meadows is less than two miles south of Paris, Virginia, via U.S. Route 50 to Route 17 South; or seven miles north of I-66, Exit 23 on Route 17 North. The park’s main entrance is on State Route 710. The par is just over one hour’s drive from Washington D.C. When: The park is open from 8 AM to dusk. Check the website for nature, history, astronomy, and other scheduled programs. How much: $5 per vehicle (updated 2018). Amenities: Bathrooms at trailhead and and small visitor’s center and gift shop near Mount Bleak House. Primitive camping available.